I feel this verse holds a lot of relevance to modern day. We COULD talk about how the Proverbs 31 woman is a giver, and a servant, and hospitable. Yes, she is all of those things, however this verse shows me that she carries no judgment for God’s children. This is a touchy subject, and has the tendency to step on a few toes, but it’s rather important. When I look at the Christian community, I see a split down the middle. I see one half who use the word “christian” as a back drop to be a finger-pointing, judgmental, high and mighty individual. On the other half, I see a community who embraces people the way Jesus did. I tend to keep my distance from controversial topics, and often get frustrated when I see “Christians” stating their opinions in a way that turns non-believers away from Jesus. This is why this verse means so much to me, because it truly embodies not only what it means to be the Proverbs 31 woman, but a Christian in general. The suffix “ian” in the Greek actually translates to the word “miniature.” In the time that Jesus was on earth, his followers we’re mocked and called “Christians,” meaning “miniature Christ.” His followers actually liked this term, I mean yeah, of course we want to be as much like Christ as possible! So they took on the name, proudly. That’s a Christian, a miniature version of Christ himself. This means we are called to love people and lead people the same way Jesus did. Remember, Jesus was referred to as, “friend of sinners.” This means Jesus carried no judgement, for anyone! 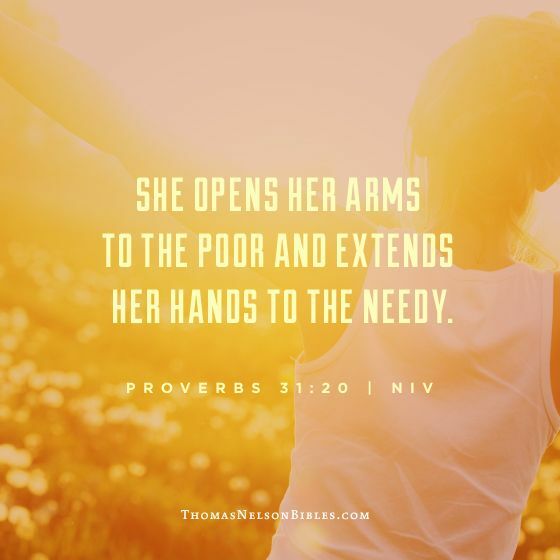 When the Proverbs 31 woman extends her hand to the poor, and reaches out to the needy – it’s because of her love for them, and her love for Jesus. She sees past the sin the same way Jesus does, and embraces them. Ever heard of the phrase, “Hate the sin, love the sinner?” THAT is Jesus, THAT is the Proverbs 31 woman. As Christians it’s far past time to get past the sins of this world, and the arguments of what’s right and wrong. We can’t change the world by pointing our fingers and rebuking the sinner. It’s going to take extending our hands and reaching out to the hurting, welcoming them into our lives, and showing them the true heart of Jesus. Arriann a is a happy-go-lucky young lady who enjoys beauty, fashion, and spreading the love of Jesus through: small groups, YouTube videos, and blogging. Her dream is to one day be a wife, mother, and friend – but most importantly a world changer for the Kingdom of God. For more about Arrianna, click here. Oh if all of us were like this! A post I wrote for Breath on Paper!